A recent addition to Jon Bondy’s line of guitar and bass products, the LBG Carbon Graphite Composite Guitar is a significant departure from the original Steinberger GL design. While retaining the GL’s minimalist design approach, the LBG is dramatically lighter while having a distinctive body shape. Compared to the GL’s 7.25 lb, the LBG Carbon Graphite Guitar is a light weight at a mere 4.5 lbs. That’s a huge difference in weight you’ll welcome during those long sets. The LBG accomplishes this weight loss with a hollow body composite back topped with a face plate. Note that the hollow body approach was not done for acoustics and the face plate is there simply to hold the controls and pickups. In fact, the face plate could be wood instead. 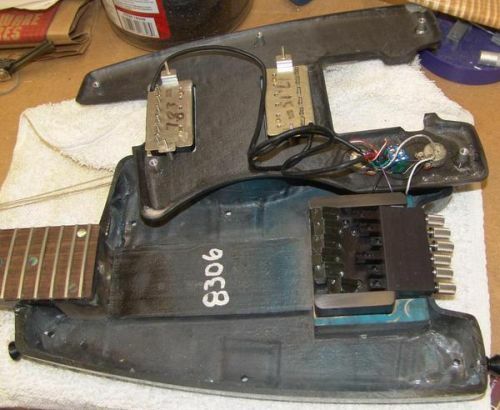 Also relevant is the guitar body’s departure from the original Steinberger GL’s broom shape. A key functional element is the introduction of a thigh rest into the design thus eliminating the kick out leg rest. The result is a travel friendly, road ready instrument that retains its tuning under even adverse conditions. The only wood found in the instrument is its rosewood fingerboard. The graphite composite quality is up to my expectation as is the clear coat finish. Fingerboard and frets are good, too. 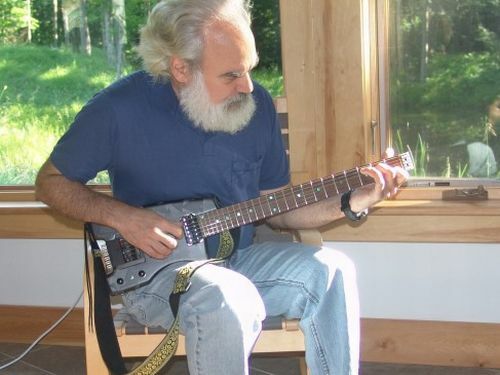 The sound of the guitar is exactly what I expected from a graphite guitar with less body thickness than GLs. Clear, focused and airy, and louder than any of my Steinbergers when played unplugged. I attributes this to the fixed bridge to a certain extent but not all, as I’ve found that the basic character of the sound is not changed when the bridge is swapped with T-trem. For more visit Jon Bondy’s page on the LBG. I like the twist on the compact “broom” shape. I’m not sure that the leg-rest is a significant ergonomic improvement (it’s not in an ideal location from a pure ergonomic standpoint) but I personally have always loved the compact shape and would make that “sacrifice” for the sake of the cool new design. I’m surprised a bit at the choice of passive “Select” pickups, but not knowing the actual cost of the guitar, I can’t say that a set of Actives or even more well-respected passives fits in with the price tag or not. I agree with the pickup choice – this is not a cheap instrument ($2K), and it needs nicer pickups. At least put something else in the marketing photos, like standard covered humbuckers. 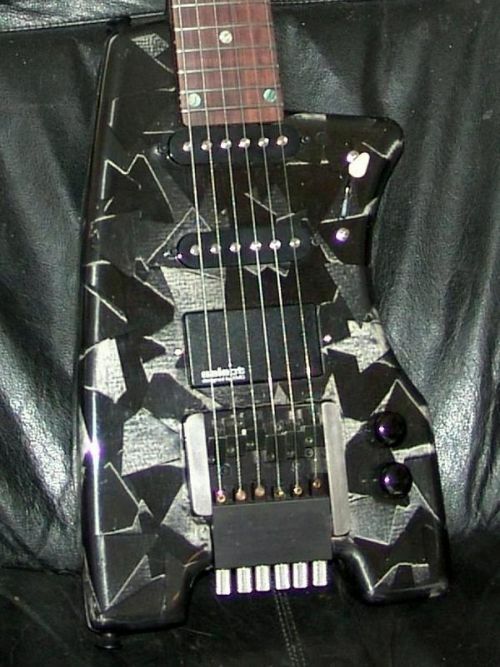 That way there is no association with the cheap Steinberger Spirit series, which uses EMG “Select” pickups. Also agreed with the leg cutout location, and I posted about that on the forum (no replies). It’s basically a semi-circle on the flat bottom edge. Looks like the neck would jut out at roughly a right angle with respect to the upright torso. Might want to experiment with tilting the cutout in order to get a little upward neck angle. I realize there’s very limited space, but I don’t think it needs much tweaking to get there. The effort is applauded and I hope we see/hear more about these axes in the near future. This is a really cool site! I just stumbled upon it looking for ergonomic designs. This guitar is really neat, and very minimal. Looks very comfortable to play. Thanks for sharing and keep rockin!! carbon fiber all of that fiber is turbostratic carbon fiber.